The monthly Pro-Life prayer vigil took place today, from 3 to 4pm, in its usual location at the main entrance to the John Radcliffe Hospital. The 'JR' is the only place in Oxford where abortions take place. Ironically, the JR has been in the news in its other role, of saving babies: a Russian woman with quintuplets who was told by her Russian doctors to abort some of them delivered them all safely, by Caesarian section, there last week. Quintuplets born to a Russian woman in a British hospital are doing well. The babies were delivered at 26 weeks by caesarean section by Dr Lawrence Impey of the John Radcliffe Hospital, Oxford. He was contacted by the mother's relatives after her doctor in Russia had advised selective abortion for some of the babies. All medical costs have been met by a group of Russian philanthropists. Congratulations to mother, babies, philanthropists and Dr Impey. It is a sad irony the JR also carries out abortions itself. This hilarious book, by Stephen Oliver, about a traditionally-minded parish priest dealing with the realities of modern church life is being published in a second edition, with illustrations and a forword by Fr Tim Finnigan; see his post. 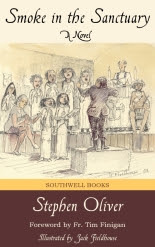 Southwell Books is publishing it; it is available here (Smoke in the Sanctuary) for £7.95. It will of course also be available at the book launch, which is taking place at 7pm on 23rd November in the Oxford Oratory's 'Prichard Room'. 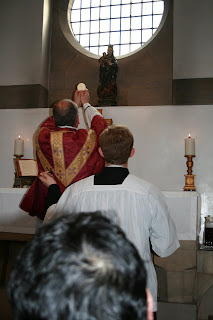 A fruit of Summorum Pontificum: Fr Danial Seward of the Oxford Oratory, who is Chaplain to the school, is now saying the Traditional Mass there each First Friday. Now that the dust is settling, after the publication of the Motu Proprio Summorum Pontificum, two serious errors in the English translation provided by the Vatican have been revealed. 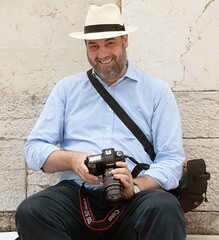 Careless and tendentious translation at the Vatican is been an extremely serious problem, chronicled in detail by the famous blogger Fr Z. In the case of the MP, no 'official' translation has been provided, but the Vatican's 'unofficial' translation, from the Vatican Information Service, has naturally been the basis of commentary, and of the 'guidance' being offered by various bishops around the world. This can lead to errors, and of course even when an official translation appears, the Latin is the normative text, not the English or any other translation. The two problems are these. Article 5 secton 1: In paraoeciis, ubi coetus fidelium traditioni liturgicae antecedenti adherentium continenter exsistit, parochus eorum petitiones as celebrandum santam Missam iuxta ritum Missalis Romani anno 1962 editi, libenter suscipiat. The problem here is the phrase 'stable group of faithful'. The 'coetus fidelium' is to be 'continenter exsistet' - continuously present, ie not just passing through. 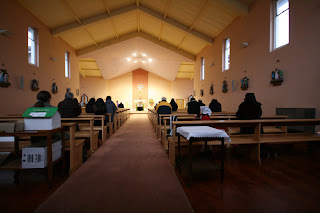 (A separate article deals with the right of people passing through to the Traditional Mass: for funerals, pilgrimages etc..) Fr Z makes this point here: the word 'continenter' does not imply that the group must be of any particular size; a 'coetus' can be three people, including the priest, and it is this which would justify a pastor celebrating the Traditional Mass publicly. 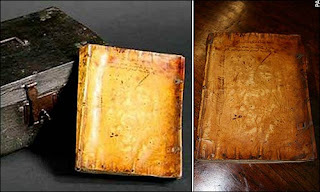 Article 5, section 4: Sacerdotes Missali B. Ioannis XXIII utentes, idonei esse debent ac iure non impediti. The Vatican translation: Priests who use the Missal of Blessed John XXIII must be qualified to do so and not juridically impeded. The problem here is the word 'idoneus' implies only legal, rather than academic or intellectual, qualification. Just as a newly elected religious superior must be 'idoneus' to take up his or her position, so must a priest who is to say the Traditional Mass. While it would certainly not be fitting for a priest to say the Mass without proper preparation, and without knowing what he was doing, the Holy Father is not imposing a requirement for any formal qualifications (passing Latin exams etc.) by using the word 'idoneus'. Fr Z makes that point here. The difficulty of translating 'idoneus' neatly has led Rorate Caeli, who adapted the English translation for its readers, to render the phrase simply 'must be idoneus'. Unfortunately, even their translation misses the first problem discussed above. Nevertheless, it is recommended because it puts the Latin and English in parallel columns. I've done a couple of posts on this over at the New Liturgical Movement (here and here), where, no doubt, they will get a wider audience. Between and around those posts are other posts, and more pictures, of the conference by other people. 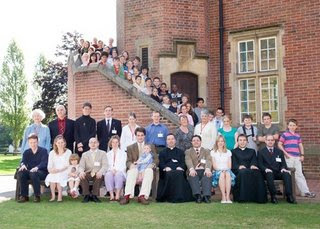 Of special local interest is the fact that no fewer than four priests from the immediate vicinity of Oxford were present at the conference to learn about the Mass. This makes me very happy, and I look forward to seeing the Traditional Mass established much more widely across the area. 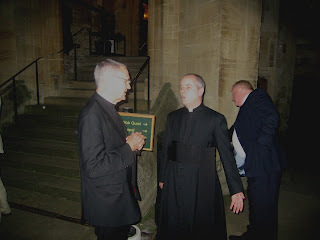 In addition to the priests coming to the conference to train, Fr Anton Webb of the Oxford Oratory was the celebrant of the Solemn Vespers on the first evening, and his confrere Fr Jerome Bertram made a very amusing speech at the conference dinner. Also at that dinner were Fr Richard Duffield, the Oratory parish priest, and Fr John Saward, pictured talking to the famous blogging priest, Fr Timothy Finnigan. 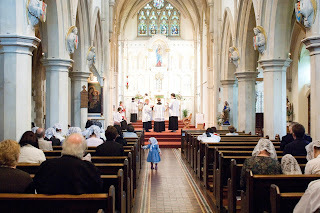 The other picture, of Solemn High Mass celebrated by Fr Anthony Conlon, chaplain to the Oratory School near Reading, shows the distinctive profile, on the left, of Damian Thompson, the Editor in Chief of the Catholic Herald. There will be a big feature on the conference in the Herald this weekend. We will be standing at the entrance of the John Radcliffe hospital for an hour of peaceful witness. Please join us and bring a friend. Refreshments available in the hall afterwards. We meet outside St Anthony of Padua RC Church. Yes, the MOTU PROPRIO is here at last! I won't add to the well-informed commentary to be found elsewhere, but anyone who hasn't watched Fr Tim Finnigan's celebratory video must do so. Fr Finnigan has provided some useful links to the text and various comments, here. This has been reported in both the Catholic Herald and the Oxford Times. 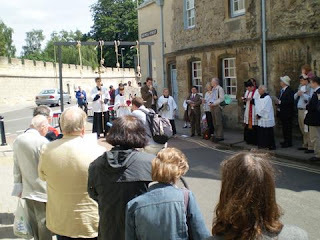 The annual LMS Pilgrimage to Oxford, in honour of the Catholic martyrs executed in Oxford, took place on Saturday 23rd June. 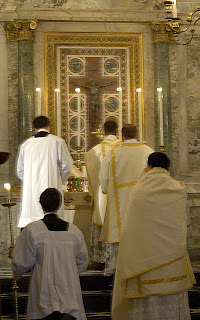 Our third pilgrimage featured the second Solemn High Mass celebrated in the Oxford Oratory since the liturgical changes, with Fr Dominic Jacob as celebrant, Fr Jerome Bertram as Deacon and preacher, and Br Joseph Welch (recently ordained deacon) as sub-deacon. 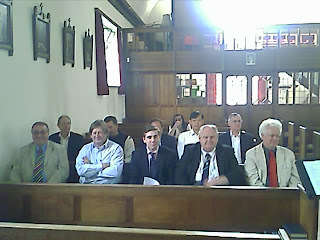 Mr Edward Stratton was MC, and an excellent team of servers was assembled for the occasion. 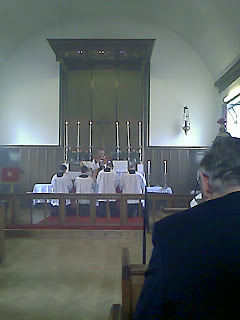 The Mass was the Vigil of the Nativity of St John the Baptist. 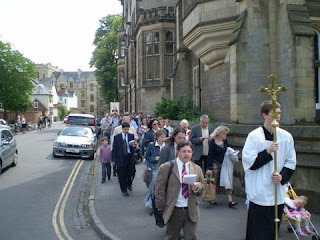 After a break for lunch, Fr Anton Webb led a record-breaking sixty-strong procession from the ancient church of St Michael at the North Gate to the East end of Holywell Street. The is the route taken by the four martyrs of 1589 – the seminary priests Richard Yaxley and George Nichols, their gentleman helper Thomas Belson, and a Catholic inn servant, Humphrey Prichard – from the Bocardo prison in Cornmarket to the town gallows where thy were hanged, drawn and quartered. All four were beatified in 1987. 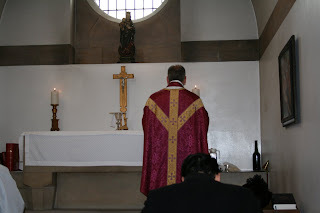 The procession sang the Litany of the Saints on the way to the gallows, and then the Te Deum and a number of vernacular and Latin hymns while we returned to the Oratory church, where Fr Anton celebrated Benediction for us. This was a great witness to the faith in the streets of Oxford. Thanks are due to the Fathers of the Oratory for their hospitality, to Fr Dominic and his minsters, and to Fr Anton, as well as to the large number of people who came, many from long distances, to join the pilgrimage. There are more pictures on another blog, here. Following the adoption of a policy supporting the right to abortion, I must cancel my membership. I have already cancelled my regular donations to Amnesty. I took part in the consultation on the matter but I see that members’ views have been ignored. This is a sad day; I have been a member of AI since I was at school in the late 1980s. I joined an organisation campaigning for human rights, not a political agenda. The protection of unborn children is as much a legitimate object of government concern as the protection of children who have been born. I have read the press release making the bizarre distinction between supporting the right to abortion and supporting a woman’s right to choose abortion, so please don’t bother me with that one. I am a published moral philosopher and I can understand English. 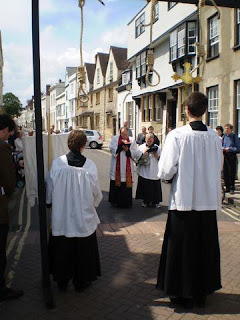 Continuing Oxford's 'marching season', the day after the Life Walk was the day of the annual Corpus Christi procession, in which the whole North Oxford Deanery takes part. This year it was led by Bishop Kenny, an auxiliary bishop of the Archdioce, and attended my many clergy of the Deanery. As usual it began at the Oratory Church, stopped in at Blackfriars, and continued to the Chaplaincy. Like the Life Walk, it too seemed to be significantly bigger than last year, and included a brass band to accompany the hymn singing, interspersed with Rosary led by megaphone. The procession is so large that a number of police were present to deal with the traffic when it had to cross roads etc.. It is difficult to photograph such a long procession, but here it is: first, the clergy and flower girls; then the Blessed Sacrament under a capony; then the main procession, including the brass band, and the banners of various parishes. 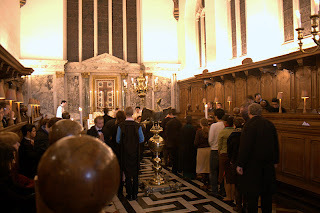 Spot the bishop's crozier being carried by an altar boy (second picture), the two Knights of Malta (Julian Chadwick, Chairman of the Latin Mass Society and Mr James Bogle, Chairman of the Catholic Union of Great Britain) (fifth picture), and a number of members of the University in 'Academical Dress' (gowns). Close up photos of the leaders of the procession can be found here. For last year's procession see here. This year's pictures are definately better! On Saturday 9th June, Oxford pro-lifers marched through the streets to support the rights of the unborn, as they do each year, starting outside the New Bodleian in Broad Street, passing through Cornmarket, and ending at the University Catholic Chaplaincy, where they had lunch. With significantly greater number than last year, interestingly there was a small counter-demonstration, with drums (! ), waiting for the procession in Cornmarket. This is the first counter-demonstration for many years, and may indicate that pro-abortion activists are concerned that the public debate has not been going all their own way recently. In accordance with a long-standing tradition, banners saying 'Save the Humans' were carried by people wearing suits representing endangered species of animals: a tiger and a panda. Thanks to all who took part in this event, the local LIFE group which organises it, and the Chaplaincy for their hospitality. For last year's Life Walk, see here. 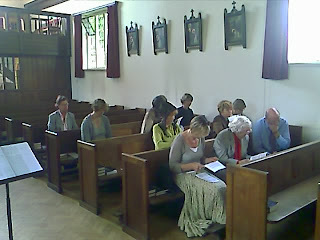 The Gregorian Chant Training Day took place on Saturday 2nd June, Ember Saturday after Pentecost (Whit Saturday). Due to Dr Berry's indisposition, the day was led by Philip Duffy, who directed music at Liverpool's Catholic Cathedral for thirty years, and coached our group with great skill, erudition, patience, good humour and enthusiasm. Twenty singers participated in the day, including some American singers from Cape Cod who were visiting Dr Berry, and others from all over England, including a visitor from York. Fr John Saward, Priest in Charge at SS Gregory & Augustine's Church in the Woodstock Road, Oxford, gave us the use of his Parish Hall, and we sang at his regular Saturday Benediction at 11, and then at a special Missa Cantata at 3.30pm, which he celebrated. Since this was the Ember Saturday of Pentecost, the Mass and the music were of a special solemnity, combining the last day of Eastertide with the penitential character of the Ember Days. So we sang numerous Alleluias, and the magnificent 'Golden Sequence', the Veni Sancte Spiritus of Pentecost, commonly regarded as one of the greatest masterpieces of sacred Latin poetry ever written, a contribution to the Church's musical patrimony made by an Englishman, Archbishop Langton of Canterbury (d. 1228). 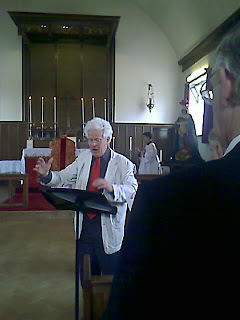 Mr Duffy succeeded in the impressive feat of turning a group of twenty singers, of all levels of experience of singing the Chant, and none of singing with each other, into an servicable choir in time for Mass, and indeed this was the most musically impressive Traditional Mass ever celebrated in Oxford, in the present writer's memory. Thanks to Mr Duffy for his time and effort, to Dr Berry and her assistants for their help, to our MC David Forster and his team of servers, to Lucy Shaw for her splendid lunch and to Fr John Saward, our host and celebrant. Such a hugely enjoyable day must certainly be repeated!